You can now pay your hospital bill online! To get started, choose the hospital you have a bill with from the list on the right hand side. Online payment is completely secure using SSL encryption. Payment facilities are currently only available for Cork and Dublin. 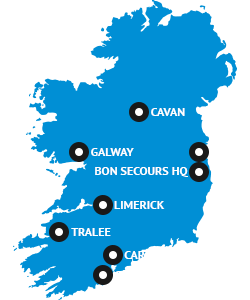 Bon Secours - Cork Online Payments Open..
Bon Secours - Dublin Online Payments Open..
Bon Secours - Galway Online Payments Open..
Bon Secours - Tralee Online Payments Open..
Bon Secours - Limerick Online Payments Open..